Our Custom-Imprinted Insulated Beverage Sleeves are perfect for serving hot beverages while protecting your hand. Made of insulated paper, these Coffee Cup Sleeves fit our our 8-20oz Paper Cup sizes. Normal production time is just five working days for all Custom Printed Insulated Beverage Wraps. Rush production/delivery is available for an additional charge. PLEASE NOTE: WRAPS ARE DESIGNED TO FIT OUR CUPS AND MAY NOT FIT OTHER BRANDS. 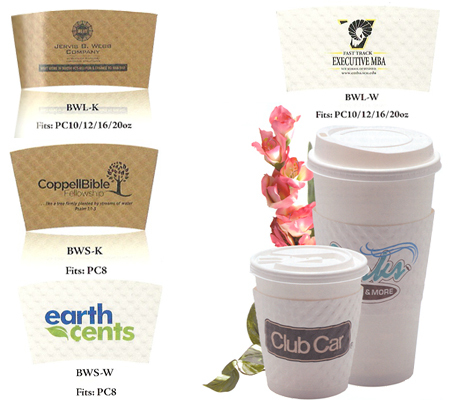 For additional information on these Insulated Coffee Wraps, please call 1-800-233-0828. Feel free to browse our wide selection of Custom-Imprinted Paper Cups, Custom-Imprinted Plastic Glasses, and Custom-Imprinted Foam Cups.